A few weeks ago, I wrote a post for Finish The Sentence Friday about how I used to love to cook. As I stated in that post, cooking has lost its luster for me. It has become more of a chore to add to my to-do list thanks to our busy schedules and my diversely picky eaters. But, you know what? I got a lot of support on that post. Some readers shared with me that they, too, used to enjoy cooking and agreed that it had become too much of a burden. Others gave me some great suggestions and even shared some recipes! If I continue to "let them," my kids are always going to be picky. The only way they are going to learn to try new things is if they are regularly exposed to new things. It doesn't have to be every meal, but at least once in a while. I shouldn't let "life" get in the way of something I enjoy. We moms sacrifice a lot for our families and most of the time, that's okay. However, we shouldn't "give up" everything. Other moms are having the same struggle. Rather than just giving up and throwing in the proverbial dish towel, I can do something that just might be helpful for me and other moms, too. So . . . . . . I'm introducing a new series entitled Sunday Supper. The first recipe I want to share in the series is one that I actually make pretty frequently and that everyone in my house likes, except for my super picky six year old. It is quick, easy and works as a side dish for almost any entree! Step 3: Cut up the potatoes into bite sized pieces and throw the pieces into a large mixing bowl. Step 3: Drizzle olive oil on the potatoes and sprinkle on the Italian Dressing mix. Stir to get them evenly coated. Step 4: Line a cookie sheet with foil and spray it with non-stick cooking spray. Then, spread the potatoes out evenly. Step 5: Pop the oven for about 20 minutes and voila! Yummy! **You can also you a packet of Ranch Dressing mix if you prefer. Do these potatoes sound like something your family might like? If you try them, I would love to know how they turn out! Awesome! Let me know how it turns out and thanks for pinning! Uhm, Yum! Those look delicious, and as someone who has completely lost my ability to cook creatively I will def try the recipe! Ah, potatoes are pretty much my favorite food. I like them any which way. And I like the way you are finding inspiration and support in cooking angst! Yummy! Potatoes are one of the few things everyone in my house will eat. Looking forward to your Sunday Suppers, Lisa - I can use all the help I can get! 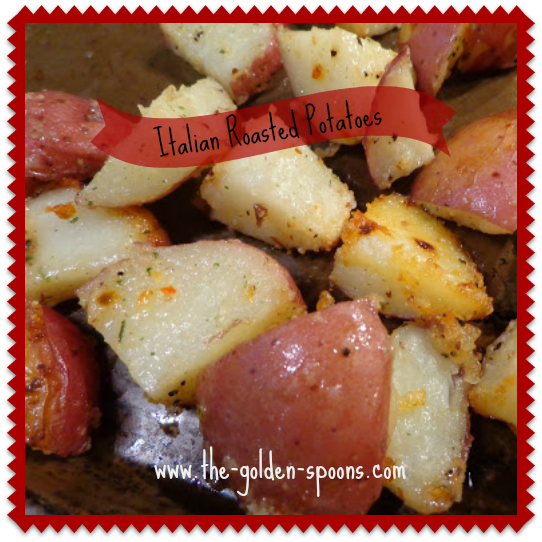 LOVE LOVE LOVE roasted baby potatoes! These look delicious! oh man, those look mighty good, I could eat potatoes all the time...I'm coming over. Awesome! Glad it was useful! We have one day a week where we stray from the basics and try something new. It's fun and it keeps me from getting into a cooking rut. I make something similar to this, but never thought to add parmesan! What a great idea!